A big challenge to fruit tree growers is the presence of fruit tree bugs. One benefit of growing your own fruit trees is the pesticide-free fruit. Infestation of bugs and insects, such as aphids and mites, can completely destroy fruit yield and kill trees. Growers can use natural ways to control fruit tree bugs as an alternative to chemicals and pesticides, without sacrificing trees and fruit. Lady bugs enjoy feasting on larvae of many types of fruit tree bugs. 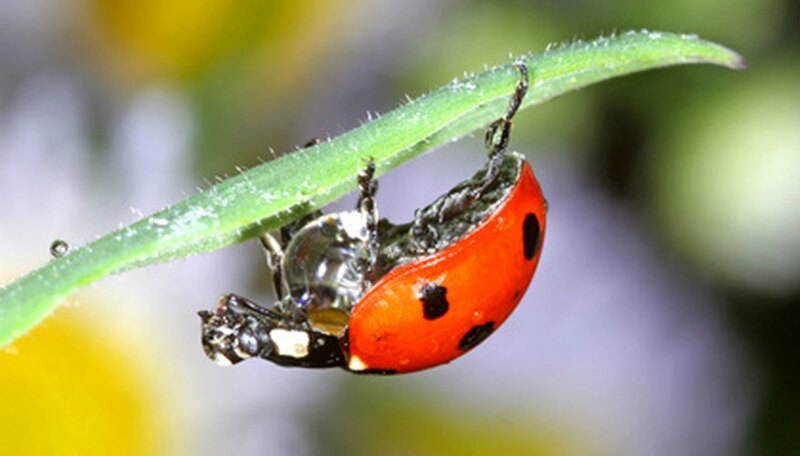 One natural way to control unwanted pests is to release a large number of lady bugs directly onto an infested tree. Growing daisy and yarrow plants in the yard will naturally attract lady bugs to the area. Use these as companion plants for fruit trees. The praying mantis is another beneficial insect for controlling fruit tree bugs. Gardeners place praying mantis eggs around the yard. They can consume large numbers of unwanted insects. Fruit tree bugs are attracted to old and infested fruit. It is imperative to examine fruit trees and growing areas for damaged, rotting and infested fruit. Removing and properly disposing of these will reduce the number of fruit tree bugs. Removing twigs, weeds and other items near fruit trees eliminates breeding areas for fruit tree bugs. Infested limbs and branches should be treated or completely removed to prevent the spread of more bugs. Rinse gardening equipment when pruning and cutting fruit tree limbs and branches, particularly when removing infested branches. Keeping the equipment clean and sanitary will prevent spreading mites, aphids and insects to other parts of the tree. There are many different types of sticky tape available to hang from fruit trees. Many of these are treated with natural pheromones that attract insects. The insects are trapped on the tape. The disadvantages to using sticky tape products are the mess and the fact that beneficial insects may be killed. Insects thrive in moist or wet environments. Keep the ground area, tree trunks and leaves free of excessive moisture. Avoid standing water at the base of fruit trees to do away with a potential breeding ground for fruit tree bugs. Healthy trees are less likely to attract fruit tree bugs. According to landscape architect Howard Garrett, the periodic use of organic and natural sprays often helps reduce insect infestation and strengthen growing fruit trees. Prune trees sparingly to reduce stress and dress any open wounds when trees are damaged.